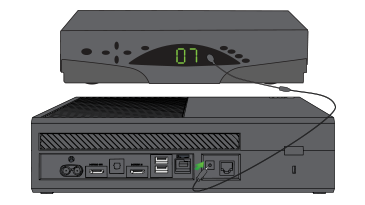 Learn how to connect your Xbox One to your home theater system. Learn how to set up the Xbox OneGuide with your Xbox One X, Xbox One S or original Xbox One so you can watch live TV while using the apps and voice commands on your console. Learn how to use IR extension cables with your Xbox One console. Learn how to use OneGuide to combine live TV with the apps and features of your Xbox One. Learn how to use voice commands to control TV on your Xbox One S or original Xbox One console.